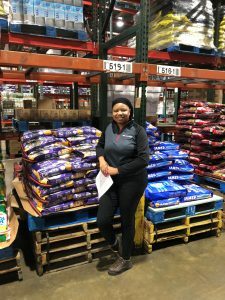 This week we are excited to introduce you to Fatimah, Distribution Supervisor at American Seaway Foods, Giant Eagle’s distribution center in Bedford Heights, OH! 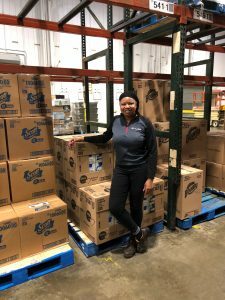 Fatimah joined the Giant Eagle family five years ago and worked her way up from an entry-level support staff role to most recently, a Distribution Supervisor. Her passion for development and commitment to learning new things is invaluable to us. Read more about Fatimah’s story here. I started in November 2012, so I’ve been here for about five years now. I started as support staff. I was counting boxes every day. I worked in receiving in perishable as a Clerk in the window. After about a year and a half, I moved up to become a Coordinator on third shift in grocery. I was a Coordinator for almost a year and a half and then I was promoted to Inventory Supervisor. I’ve been an Inventory Supervisor for a little over a year now, so it’s been a change. I’ve been able to work my way up. 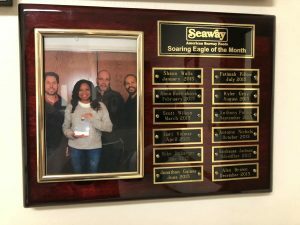 I got to see the growth within the Company, where you can start from an entry-level position and meet and exceed your goals and be rewarded for those goals, which is really rewarding in a position like this. It’s nice being in the position that I’m in because I started out as support staff. It helps me build those developmental relationships with my Team Members. It helps them get to where I’m at. It’s an attainable goal. They can see that if they work hard, they can get promoted. I’ve been where they are now. What made you think of Giant Eagle as a possible place of employment? I thought about the fact that the Company has been around for so long. I knew a couple people who had worked at Giant Eagle in the stores, and they’ve been there for a very long time. I knew it was a solid Company, especially because at the time the economy was kind of shaky but Giant Eagle was still steady. Everyone needs groceries. Do you participate in any of Giant Eagle’s Business Resource Groups? I participate in the African American Business Resource Group and the Women’s Business Resource Group. These groups are focused on inclusion. 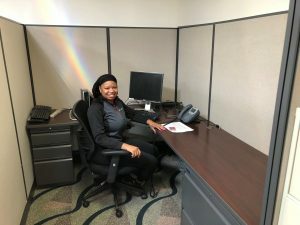 It’s nice because our Company acknowledges we have smaller groups, but they play a big role in the overall Company, and they don’t want to leave anyone out. These groups give us an opportunity to make sure everyone feels included and their presence in the Company doesn’t go unnoticed. I won the Employee of the Month in July 2016 and then I actually went on to win it for the year, overall. I won it for exceeding my goals and standing out. It was really nice. I got tickets to a basketball game and had breakfast with the Operations Manager. It made me feel good that the Company did more than say they appreciate me, they really made it a point to tell me that I stood out and they value what I put forth. 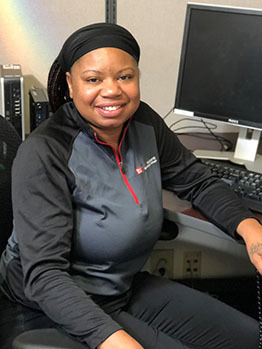 Meet Denise, GetGo Team Member in Ebensburg, PA! Introducing David, GetGo Team Leader in Somerset, PA!